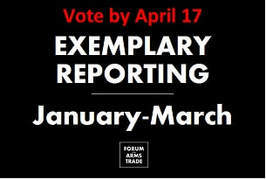 Forum on the Arms Trade-listed experts have nominated reporters and articles as being exemplary examples of journalism that uncovers new information and/or expertly explains issues related to the arms trade, security assistance, and weapons use that was published from January 1 to March 31, 2018. This is just a sample of good reporting on Forum-related issues and is not reflective of a complete sweep of the media landscape. This poll will close at 11:59PM (EST) on April 17.